Two weeks ago, a young beluga found itself in a place it didn’t belong. “At that time, my first reaction was ‘oh wow it’s so small.’ And then, ‘oh no, not again,’” says Robert Michaud, scientific director of the Group for Research and Education on Marine Mammals (GREMM), who first became aware of the situation when he received an emailed tip. Michaud’s worry is well-founded given previous records with rescue operations. They'd encountered similar situations in 2001, and at that time, two of the animals died due to their long stay in the river. Although they did successfully remove another from the river, most cases have a tragic end. 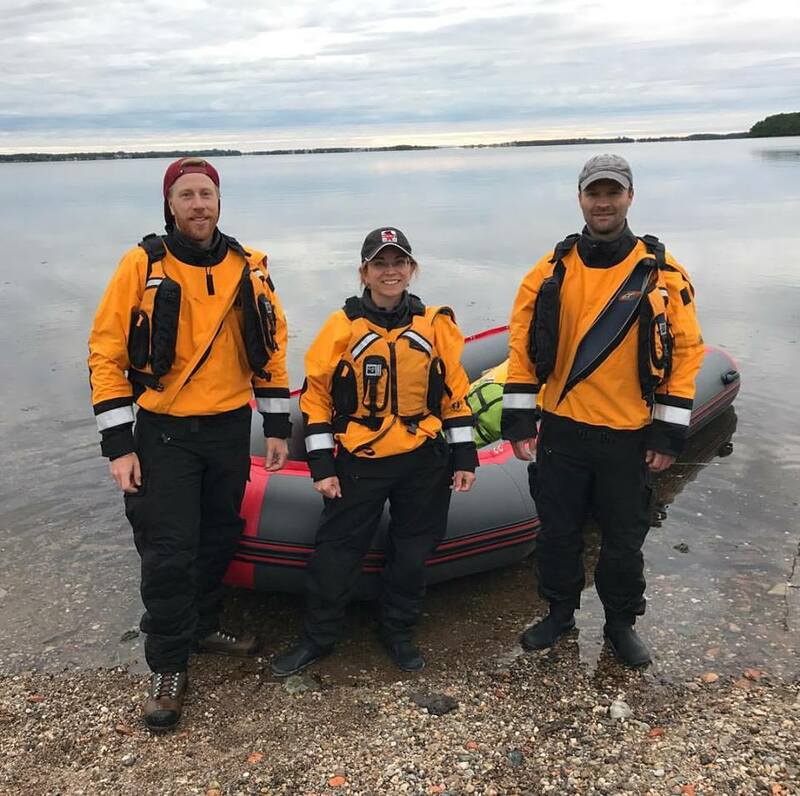 The wayward whale was first reported in the Nepisiguit River on June 2 to the Marine Animal Response Society, who checked on the animal a number of times to see if it was in distress. Rescue plans began at 9:00 a.m. June 15, with scientists and health experts from GREMM, the Department of Fisheries and Oceans, the Shedd Aquarium in Chicago and Vancouver Aquarium all working together to help move the beluga to the St. Lawrence River. The whale, initially believed to be an adult, was identified to be a two to three-year-old male – 240 metres long and weighing just under 200 kilograms. Knowing that young belugas are especially curious creatures, the group first tried to walk towards it in the shallow water to see if it could be coaxed into a net. No luck. “In rescue operations like this, it never goes as you planned, so you need a plan ABCDEFG at least,” says Michaud. Plan B was to get a boat out to the whale to capture it. The team tried to use several different approaches, at first using a hook net, then a sea net. This is when Wimmer and her team were able to get their first close-up look at the beluga and noticed its skin was a little bit wrinkly. The whale was also calm, which according to Michaud spoke to a worrying condition. After persuading the cetacean into a sea net, the rescue team transported it quickly into a stretcher and then into the back of a truck to take it to the Bathurst airport. In the truck, a team of veterinarians including experts from Shed and Vancouver aquarium, quickly evaluated of the whale’s condition. “The first results showed that the animal was not in good shape,” says Michaud. Blood samples showed the whale’s electrolytes levels and sodium were very low, likely due to a large consumption of fresh water and having not fed a lot, if at all. Having moved the whale onto the plane, the first rescue team watched as the plane took off. Their job was done. “During the event itself, your mind is stuck on keeping track of the animal and people. You’re sort of single-minded. When we put the animal on the plane, it was the first time where we just went, “Huh.” So far, more than 30 people from all other walks of life had helped this animal who needed to get back to its natural habitat. It was very surreal,” says Wimmer. The second team took over when the plane landed in Quebec, transporting the whale by truck to Rivière-du-Loup alongside experts. Although the animal’s condition was stable throughout the trip, it was still very weak. The group took a shortcut to the harbour with Quebec police escorts, says Michaud. At Rivière-du-Loup the harbour master provided a crane to move the whale to the dock to be assessed for a final time before release. New blood samples were taken, as well as two biopsies— one from a small lesion discovered on the whale and another for genetic information. 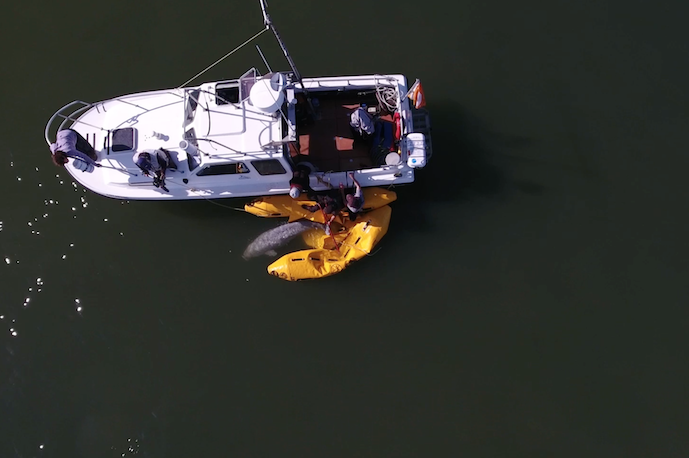 Equipped with satellite tag, the whale was placed on a floating pontoon attached to the Bleuvet, the Group for Research and Education on Marine Mammals' research vessel. About two miles from the harbour, the group found a small, well-dispersed pod of females and released the young male to join them at 4:54 p.m on Thursday June 15. 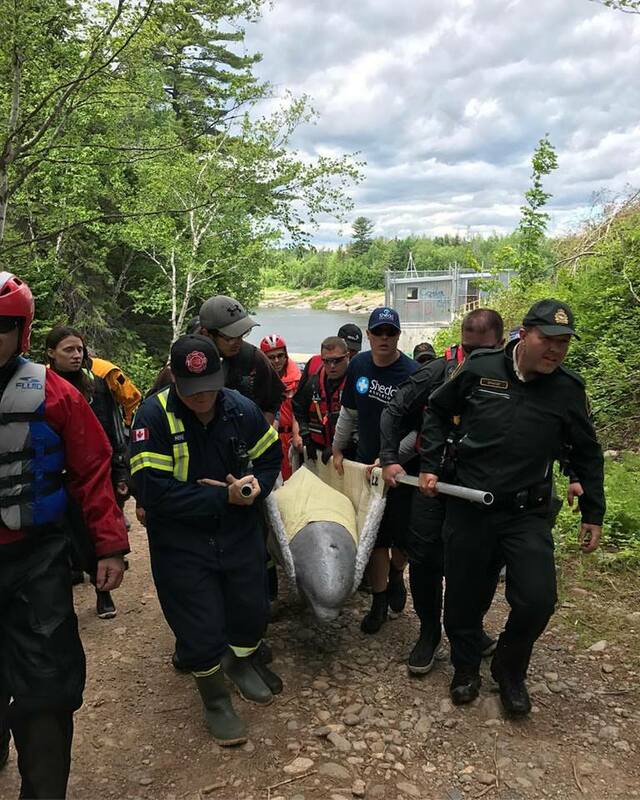 After more than 7 hours, the stranded whale in the Nepisiguit River had been safety returned to its natural environment. The rescue operation provides an important test-run for the inevitable future operations, says Michaud. “It is a small population of endangered belugas; the situation is more critical than it has ever been and situations like this one can happen. We took this operation to see if it is possible to catch and release a vagrant. Now, we will monitor it to see if it will survive,” says Michaud. The organization for the operation was the first of its kind and Michaud says its success came from all the expertise that was brought together. “Altogether my first reaction was amazement. We had up to 18 organizations mobilized for the operation,” says Michaud. The group is relieved that the whale is safely out of the Nepisiguit River, but are saying it is not sure yet how the whale will fare. “We’re always optimistic, but cautiously optimistic. That animal had the best people looking after it for the capture and release. We are even optimistic on seeing it being released and how it really started swimming away. It showed us that it still had strength,” says Wimmer. Two nights ago, GREMM tracked the animals via satellite surveillance and saw things were moving smoothly. As of now, the group is still traveling together but it is not yet confirmed if the young beluga is alive.